Thursday and Sunday's games have come to an end and with byes starting this week, many owners were left hoping some riskier bench players would pay off. Let’s review some of the best and the worst fantasy performances so far in Week 5’s Fantasy Football Wrap Up. Deshaun Watson finished the week as the 1st ranked quarterback after throwing all over the Kansas City Chiefs for 261 yards and 5 passing touchdowns, and ran the ball 3 times for 31 yards. Watson continues to get better as the year goes on and finished the day with 35.50 fantasy points. Dak Prescott had himself a nice outing against the Green Bay Packers, passing for 251 yards and 3 touchdowns, while also carrying the ball 4 times for 37 yards and a score. Prescott finished the week as the 2nd ranked quarterback with a total of 29.70 fantasy points. Ben Roethlisberger had a nightmare outing at home against the Jacksonville Jaguars this week after throwing a career high 5 interceptions (2 of which were returned for defensive touchdowns). Roethlisberger threw for 312 yards but did not throw a touchdown pass, en route to a total of 2.60 fantasy points. Russell Wilson cooled off from last week's 27.6-point performance, finishing as the 19th ranked quarterback of the week. Wilson only threw for 198 yards, 1 touchdown and had 1 interception against the Los Angeles Rams and finished the day with 11.50 fantasy points. Chargers’ Melvin Gordon finished as Week 5’s highest scoring fantasy running back after a 34.30 fantasy point performance. Gordon carried the ball 20 times for 105 yards and 0 touchdowns, and hauled in 6 receptions for 58 yards and 2 touchdowns. Rookie running back Leonard Fournette took advantage of his matchup against a weak Steelers run-defense, carrying the ball 28 times for 181 yards and 2 touchdowns. Fournette also added 8 yards on 1 catch and finished as the second-highest scoring running back of the week with 31.40 fantasy points. Carlos Hyde was seldom used this week against the Colts as he only carried the ball 8 times for 11 yards, and added another 7 yards on 1 reception. Hyde took a backseat role to Matt Breida and finished the week with only 2.80 fantasy points. Ameer Abdullah also disappointed fantasy owners this week, running for 31 yards on 10 carries and did not score a touchdown. Abdullah added 3 yards on 1 reception and finished with 4.40 fantasy points. A.J. Green had a huge day against the Buffalo Bills, hauling in 7 receptions for 189 yards and a touchdown. Green finished the week as the top ranked wide receiver with 29.90 fantasy points. DeAndre Hopkins only had 4 receptions Sunday night against the Chiefs but was very efficient. Hopkins accumulated 52 yards on his receptions and found the end zone 3 times. Most of Hopkins’ points were in garbage time, and moving forward it is nice to see that Watson continues to deal the ball down the field even with the game out of reach. Week after week, Amari Cooper continues to disappoint fantasy owners. Cooper only caught 1 of 2 targets for 8 yards for a total of 1.80 fantasy points. Over his past three games, Cooper is averaging 2.10 fantasy points and 0 touchdowns on 1.33 receptions. At this point in the season with Derek Carr sidelined, Cooper is purely name value and is, at best, a WR3 /flex play. The Eagles scored 4 passing touchdowns on Sunday and Alshon Jeffery was held out of the end zone. Jeffery was held to 31 yards on 3 receptions and finished as the 59th ranked wide receiver with 6.60 fantasy points. Zach Ertz is the go-to guy in the Eagles offense and with Jeffery matched against opposing defense’s top cornerback each week, Jeffery’s upside some weeks will be limited. 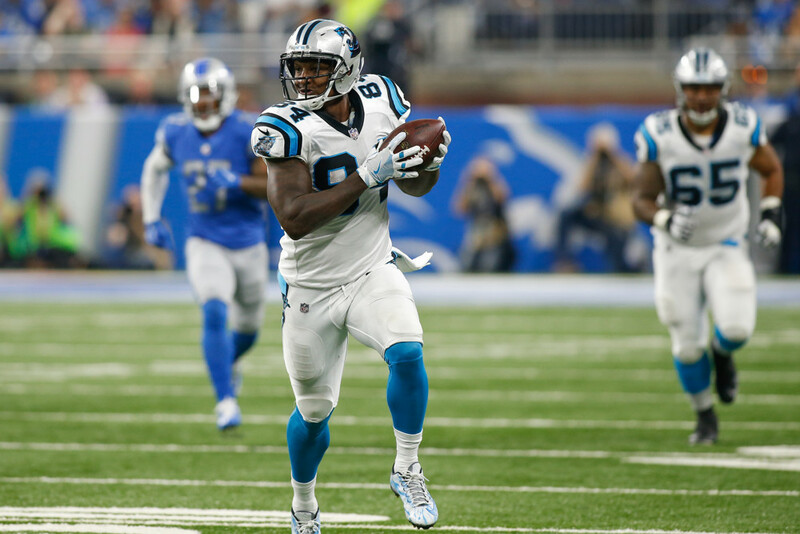 In a week filled with byes and injuries, the highest scoring tight end in full-point PPR leagues this week was Panthers’ Ed Dickson who hauled in all 5 of his targets for a whopping 175 yards, totaling 22.50 fantasy points. 49’ers’ George Kittle rose to the occasion against the Colts hauling in 7 receptions for 83 yards and 1 touchdown. Kittle finished the week as the second-highest scoring tight end with 21.30 fantasy points. Those who started Eric Ebron this week were disappointed once again as he could only haul in 1 reception for 6 yards, for a total of 1.60 fantasy points. Over the past three weeks, Ebron has averaged 3.07 fantasy points and cannot be started with much confidence. Ben Watson caught 2 passes for a mere 2 yards, for a total of 2.20 fantasy points. With bye weeks in place, these tight ends that were started in many leagues sure didn’t pull through for owners. The Jacksonville Jaguars Defense continued beating up on opposing offenses this week after intercepting Ben Roethlisberger 5 times (2 for pick-sixes) in addition to 2 sacks. The Jags only allowed 9 points against and finished the as the highest scoring defense with 26.00 fantasy points. The Miami Dolphins Defense got to the quarterback early and often, and were able to hold a Mariota-less Titans offense to only 10 points this past week. The Fins finished with 6 sacks and 2 fumble recoveries, one of which was returned for a defensive touchdown, and finished with 22.00 fantasy points this week. Chiefs’ Harrison Butker finished the week with 21.00 fantasy points, which ranked him as the highest-scoring kicker. Butker converted 5 field goals from 35, 25, 41, 42, and 49 yards, and added 3 extra points. The second-highest scoring kicker from this past week with 18.00 points was Adam Vinatieri from the Indianapolis Colts who hit field goals from 23, 23, 51, and 52 yards out while also kicking 2 extra points.